When Should Babies Start Eating Fish? You already have the knowledge about the importance of balanced diet consisting of vegetables, fruits, lean proteins and whole grains for humans; however, when talking about toddlers and babies one thing that parents usually do not include in their diet is fish. The reason for this is that fish is usually not considered as a baby food by most of the parents. When can fish be eaten by babies? When Can Babies Eat Fish? You can include fish as a part of the diet of your kid as soon as they start eating solid foods, usually when they are about four to six months of age. However, if your kid suffers from food allergy or chronic allergy, then you should talk to your physician first as fish is among the top foods that may cause allergies. Moreover, majority of the physicians recommend beginning with traditional solid foods first (including pureed fruits, vegetables or meat and baby cereal) before offering fish to your baby. 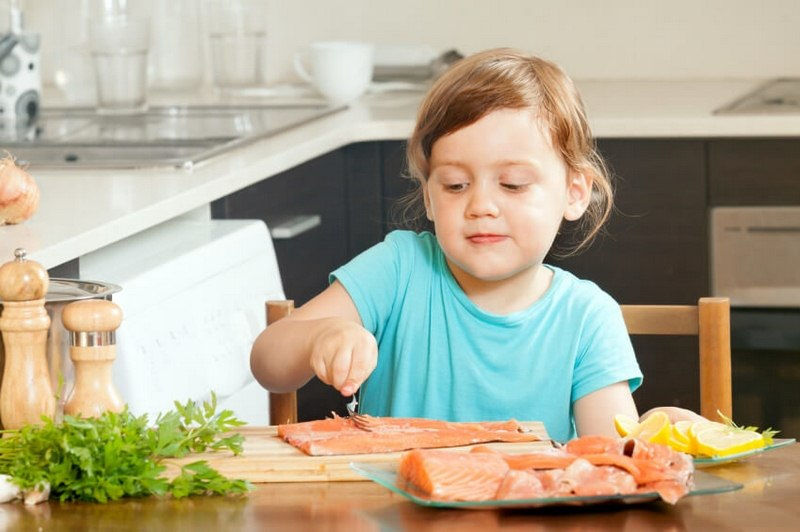 According to AAP (American Academy of Pediatrics) section on Allergy and Immunology, majority of the babies, even those who have mild eczema or have a family history of asthma or food allergies, may begin eating fish after they are introduced with few foods that are less allergenic (such as vegetables, fruits and cereals) without having an allergy to it. Suffers from severe to moderate eczema post following a treatment plan for skin by a physician. Has an immediate allergy to a particular food in past. Was diagnosed with allergy to a food in past. While introducing a food that may cause allergy, you should give it to your kid at home and not at a restaurant or daycare. Serve any new food for at least 3 to 5 days before serving any other food. This way, you will be able to monitor your kid for a possible reaction and know the cause of it. Symptoms and signs of allergy to food are swelling of face (including lips and tongue), wheezing, skin rash, vomiting, diarrhea, and cramps in abdomen. In case your kid has any of the above signs or develops trouble in breathing immediately post consuming a new food, contact 911 or local emergency helpline number immediately. Mercury: Fish is a rich source of vitamin D, omega-3 fatty acids and certain other nutrients; however, high amount of methylmercury is present in certain kinds of fish. It is a metal that is harmful in large doses to the developing nervous system and brain of child. According to the FDA you should avoid giving your kid shark, king mackerel, swordfish, and tilefish, all of which are large fishes, which contain highest amount of mercury. To keep the levels of mercury down, you should limit the quantity of fish your kid eats to not more than 12 oz in a week. Fish types which contain less mercury are canned light tuna (not white or albacore tuna which has high mercury), cod, salmon, flatfish, Pollock and catfish. Viruses and Bacteria: Ensure to cook the fish thoroughly so that food borne viruses and bacteria which thrive in undercooked and raw fish are killed. Choking: To avoid choking in your kid debone, puree and mince the fish. After discussing “When can babies eat fish?” let’s discuss how to introduce fish to your baby’s diet. Have been cooked thoroughly. Avoid fish that are ceviche cooked or raw or underdone. Have lower quantity of mercury in them. Avoid fish including king mackerel, shark, tilefish and swordfish. Have mild flavors as they are more readily accepted by babies. Your baby may readily accept fish with mild flavors and taste such as white fish instead of fish with a distinct “fishy” and strong taste. You can start with mild tasting fish such as cod, flounder, sole and haddock. As your kid start liking fish you may offer them fish with stronger flavors. How to Prepare Fish for Your Baby? Fish for babies can be prepared in various ways including poaching, baking and steaming, which are healthier than pan-frying. The fish also becomes softer when prepared by using these methods and you can easily mash it for your baby. In case you are preparing the baby food for your kid, you may process fish to the texture desired by your kid. You can also combine it with a vegetable or fruit of your baby’s choice. Be creative while combining different ingredients. Though combining fish and peaches may sound odd to you, but your baby may love it. If your baby is ready to eat on table, they may self-feed on deboned fish that is cooked properly. Just make sure to cut the fish into small pieces, which your baby can handle. What Is the Quantity of Fish Your Baby Should Eat? For babies who have just started eating solids, around two oz of wild salmon in a week is recommended. Once your kid is off breast milk or formula milk, you can give them six to seven oz in a week. In case your baby does not eat that much fish in a week, you may consider giving them a supplement. You may ask your physician for an appropriate recommendation. Initial research in the year 80s and 90s suggested that babies who consumed formula containing DHA had better cognitive development. This led the US FDA to allow supplementation of infant formula with DHA (omega-3) in 2001. According to a 2003 study, females who consumed supplements with omega-3 during lactation and pregnancy had an increase in the cognitive abilities of their children at four years of age. Another study in 2005 demonstrated that school kids who consumed supplements containing omega-3 showed improved spelling and reading scores. Since the growth of brain of a baby is fastest in the prenatal period and it continues its rapid growth during the first year, this is the best time to include DHA (omega-3) into their diet. It was found in a study that babies of females who had higher levels of DHA at the time of delivery had better focus than babies of mothers who had lower levels of DHA. Omega-3 helps in improving vision in babies. According to research females who consume fish rich in omega 3 during their pregnancy have less chances of developing postpartum depression. Omega-3 fatty acids may raise the levels of feel good hormones including serotonin and dopamine that are the neurotransmitters also targeted by certain prescription antidepressants. Omega-3 fatty acids have been linked to enhanced immunity. In one Danish study, babies who drank fish oil supplemented formula had higher blood levels of a protein, which is a marker of healthy immune system in comparison to those babies who drank cow’s milk or plain formula. Omega-3 helps in reducing inflammation in all body parts including skin. Making your baby eat a small quantity of light tuna or salmon before they are nine months old may help to prevent the development of eczema in them. What Could It Be If Baby Is Shaking Head Side to Side? What Are the Symptoms of Teething?